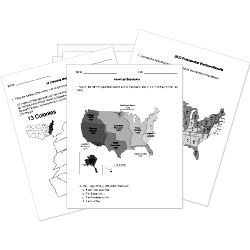 You can create printable tests and worksheets from these Grade 7 Africa and Middle East questions! Select one or more questions using the checkboxes above each question. Then click the add selected questions to a test button before moving to another page. The Mali Empire reached its height under which king? What was introduced in the 3rd century CE that led to changes in trade routes? In the 13th century CE which Empire conquered Ghana? Which city, famous for its scholars, was captured by Mansa Musa in CE 1324? Who was first ruler of the Songhai Empire? Called the "Lion King", who was the first ruler of the Mali Empire? Who was the first ruler of Mali to make the Hajj? Which Aksumite king converted to Christianity? What was the capital of the Mali Empire? The Songhai Empire reached its height under which ruler? Which kingdom, south of Egypt, was taken over by Aksum during the 1st century CE? What was the title of the kings of Mali? What is the main religion of the countries in the region of North Africa? The Barbary Pirates raided Iceland. What city was the capital of the Aksumite kingdom? The Kingdom of Aksum was primarily located in modern day Eritrea, and . What was the title of the ruler of the Benin Empire? It is believed that the founders of the Ghana Empire were blank/]. The Ghana Empire was located in modern day Mali and .